This seems like an oddly muddled approach, but it works fairly well for the most part. As an action film, First Blood provides a reasonably tight experience that follows the “Rambo against the world” story. The film features little plot, but it maintains a good sense of drama as it progresses, at least until it runs toward its conclusion. 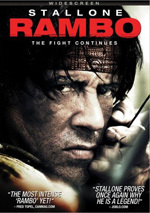 The last act contains some improbable and excessive acts, especially in the way Rambo turns against the whole town. Why did he decide to blow up a gas station and some other spots? This makes no sense; his beef is with Teasle and his ilk, so why go after the general population? First Blood appears in an aspect ratio of approximately 2.35:1 on this Blu-ray Disc. Though usually good, this was an inconsistent presentation. Sharpness varied. Some shots demonstrated terrific definition and detail, while others could be somewhat smeared and soft. I thought the transfer used a bit too much noise reduction at times, and that may have caused some of the tentative shots. Overall clarity remained good, though, and I noticed no shimmering or jaggies. Edge haloes were absent, and source flaws were minor; I detected a handful of specks but nothing more. First Blood featured a subdued, naturalistic palette, and the DVD replicated those hues nicely. The colors came across with good accuracy and depth, and they showed no signs of noise, bleeding or other issues. Black levels came across as dark and dense, while shadow detail seemed appropriately heavy; though some shots could be a bit thick, that was clearly due to the original photography. Only the issues with noise reduction and softness made this a “B” image, as it had more strengths than weaknesses. As for the film’s DTS-HD HR 5.1 soundtrack, it provided a fairly solid soundfield. The forward spectrum dominated the proceedings and offered reasonably good spread across the front. Music showed nice stereo presence, while effects moved cleanly and accurately across the channels. The surrounds added occasional reinforcement, and they also became more active during a few scenes; helicopters would zoom from front to rear, and dogs barked in the back. However, the front presented the strongest presence, and the track seemed to offer a reasonably involving soundfield. Audio quality turned into a weak link, though. Speech sounded slightly thin on occasion, and a little edginess appeared. However, dialogue generally was distinct and natural, and I discerned no problems related to intelligibility. Effects displayed minor distortion at times, mainly due to gunshots, and those elements tended to seem somewhat feeble; even explosions and “big bang” sequences lacked much heft. The score also failed to deliver good range, as the music sounded thin and weak. The soundfield was fine for its age, but the quality of the audio seemed mediocre at best. 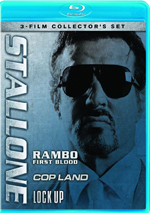 How does this 2012 “Stallone 3-Film Collector’s Set” edition of First Blood compare to the original Blu-ray from 2007? It duplicates the older disc literally – the “Collector’s Set” simply takes the original Blu-ray and places it in a new package. The Blu-ray mixes extras from a couple of different DVD release. We find two separate audio commentaries, the first of which features novelist David Morrell. According to the credits, Morrell had no direct involvement in the movie; they based it on his book, but that was that. Because of this, I didn’t expect much from the commentary other than a comparison of the two, and I thought this would be a bland piece. I was wrong on both accounts. Yes, Morrell does tell us many differences between novel and film, but he also adds a slew of great production notes and anecdotes about the film. He possesses a wealth of knowledge about the movie - and the rest of the series, it appears - and he offers an engaging and lively personality. Almost no dead spaces appear, and Morrell only occasionally tells us what we see on the screen. Usually he interjects a quick statement in that regard but then quickly returns to his story. Folks who like commentaries that stick heavily to the onscreen action might not like this one, but I think it provides a consistently entertaining and informative track. The second commentary presents co-writer/actor Sylvester Stallone. He provides a running, screen-specific chat that looks at the “curse” of the project and his reluctance to take the role, aspects of the character and his performance, the other actors, their work and their parts, stunts, action and fights, the script and rewrites, location and sets, and some tensions during the shoot. After this we find Drawing First Blood, a 22-minute, 35-second documentary about the movie. The program mixed shots from the film, production stills and other archival materials, and recent interviews with participants. In the latter area, we hear from director Ted Kotcheff, novelist Morell, executive producers Andrew Vajna and Mario Kassar, producer Buzz Feitshans, and actors Sylvester Stallone and Richard Crenna. Despite its brevity, the program offers a very nice look at the production. It traces the film from its origins as a novel through early attempts to make it, casting, and various aspects of the shoot. We see some stills from an unused ending, and also check out a poster that featured Kirk Douglas in Crenna’s role, but unfortunately, we don’t watch any actual footage of either. Nonetheless, “Drawing” provides an entertaining and informative piece that seems consistently enjoyable. Out of the Blu offers a trivia presentation. With this activated, pop-up windows will tell you about the original novel, changes made for the screen, production notes, survival facts, wounds incurred by movie characters, and some other elements. The pop-ups don’t appear with much frequency, but they add some decent information, and the presentation is unobtrusive enough that you can watch the movie and not mind the presence of the windows. The disc opens with ads for The Descent and Crank. These also show up under Blu-ray Trailers, which actually relaunches the Blu-ray again. No trailer for First Blood appears here. 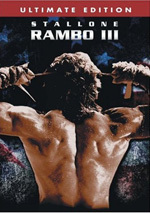 Although its sequels made Rambo a household name, I think only the original film stands up after all these years. First Blood has its flaws, but it generally offers a vivid and compelling action flick that also includes more depth than usual. The Blu-ray provides positive picture and some interesting supplements but the audio seems thin and lackluster. Despite the soundtrack concerns, this was a fairly nice release. 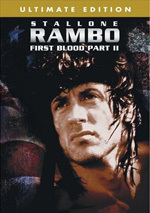 Note that this version of First Blood comes as part of “Stallone: 3-Film Collector’s Set”. This package also includes Blu-rays for Cop Land and Lock Up. None of them include anything exclusive, but they compile the three movies together at an appealing list price of less than $25.